2.2.1 Where will the Article be located? The aim of this document is to work through, hands-on, creating a new article using the Front-end of the Joomla! web site. Authors cannot 'publish' articles - which means that they do not display until someone with publish permissions has ticked the right box. Publishers can see a tick-box (which shows whether an Article is Published) when they edit or create an article - so they can publish their own, and other peoples', articles. Editors and Publishers can edit documents that they did not create. To get an Article published depends on the way the site is managed. Publishing is often done by the site Adminstrator. If you are an Author you are likely to need to ask for it to be published before you can do more work on it but Editors can continue to edit before it is published. You can easily start a new article for yourself although exactly how you do this depends on how the Web site you use is set up. A User Menu with the option to start a new Article, called here Submit an Article. Sometimes this option is under the Main Menu. 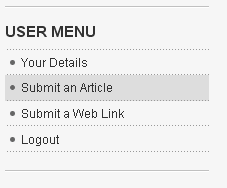 The editing screen (called Submit an Article) is loaded. This is the same editor as used for editing Articles, except that it has no content and no title. Before saving a new article for the first time, you need to enter some information in the Publishing section of the editor, including whether it is published and where it is to be located. Where will the Article be located? This depends on the organisation of the Web site. If you are using an existing site, you need to be told which Section and Category it will be assigned to. Or it may be uncategorised, but you need to know that this is the case. You will also need to know which menu it will be located under. Again this information varies with the way the Menus are set up and the layout of the Site. If you are a Publisher, type a few lines and then go to the Publishing part of the editor and Save it. You will then be able to continue editing. If you are an Author it is worth typing quite a bit of content at this stage before adding the details in the Publishing part of the editor. This is because you will not be able to return to editing until it has been published. If you are an Editor, you can continue to edit the article after it has been saved, even when it is not published. Scroll down to the Publishing section. You must make a number of choices about where the new Article will be located and who will be able to read it. 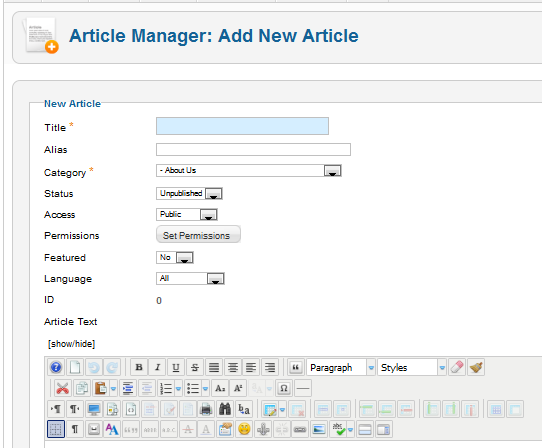 Here the user has Publishing permissions so the choice for Published is displayed. Getting the Section and Category correct usually means that it will display in the right place. The choice of Section and Category will depend on those available on the site you are using. This is the Sample data in 'localhost' and shows the Section and Category chosen. Front Page: leave this as No. The exception would be if you are writing an Article for the Front page which is in 'Blog' layout format. Access Level: choose the appropriate one for your site. Public means that anyone visiting the Web site can read it. Registered means that people who have logged in but do not have any write access can read it. Special means that Authors, Publishers and Administrators can view and edit it. This saves the Article in Joomla! and returns you to where you started (not to the editor). If you are an Editor or a Publisher - you should now be able to find the article in the place you expect! a blue pencil for one that has not been published. Next time you save it, you will not have to fill out the Publisher part of the editor again. If you want to do more editing and learn how to manage Articles using just the Front-end of the Site - then look at the documents under More hands-on altering and manipulating Articles in the Index to other documents below. For setting up a site yourself, look at the documents under Hands-on setting up a Joomla! site in the Index to other documents below. Article Management is a compendium of short documents about all aspects of Articles, aimed at all levels of expertise. This page was last modified on 6 June 2013, at 07:21.